We're right back there, in that same moment. 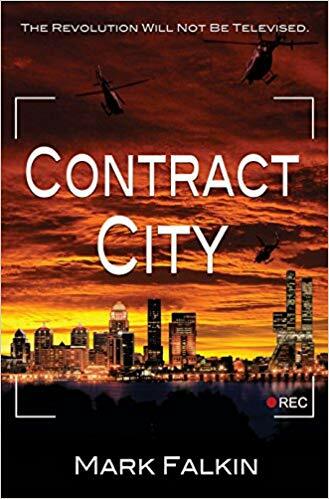 "In Contract City, Mark Falkin dreams up a near dystopian future that is already eerily upon us, where privatized services are becoming standard fare, where fear is now palpable and our sense of security comes with a price. I happened to come across this fine book in the fall of 2016, and in many ways it's been a sobering glimpse into the age of Trump." "A YA novel as intelligent and intriguing as any I've seen"
"Falkin focuses as much on wordcraft as plot twists, which elevates this believably futuristic tale, as do the universal teen concerns of Sara and her friends. (Ages 14 and older)"
After the assassination of the President seven years ago, after the riots that followed, riots so severe that martial law was implemented, in 2021, the nation has changed. And though things have changed, some things remain the same. Like many teenagers, seventeen year-old self-admitted film geek Sara Christie wants to be understood and escape her current life. Her family life is falling apart, due to her estrangement from her mother and the fact that it is clear that her parents are headed for a divorce; her high school social life isn’t doing much for her, though she has a great friend in Nikki; twin brother Adam is maniacally training for the big Army-sponsored gaming tournament; and her love life is, well, non-existent. But she’s passionate about film, and with her junior year coming to an end, she embarks on a summer during which she intends to make the documentary film needed for her college application to UCLA’s vaunted film program. She’s got the grades, the extracurriculars, and now, the perfect film subject: over the last few months, someone has been creating impactful, transgressive yet beautiful street art, graffiti mostly, all over her home town of Tulsa, Oklahoma, a city that has become the first fully privatized city in the country . . . and a police state. Everybody’s talking about the street art which now threatens to rise from the underground and come into mainstream focus, exactly where Tulsa’s power structure doesn’t want it. In making her film about the art, who’s making it and why, Sara captures something that quickly finds her caught in a crucible wherein everything she values is threatened, including her beloved father, her mysterious first love, her volatile hometown about which she learns more than she wants, and, quite possibly, her life.